Click here to leave a message. Keep it short and Type it exactly as you want it to be seen. This morning I was notified by Larry Walsh and Mike Owens that our sister and long time Air Trash member Linda Hardesty passed. That's all I know at this time. Will update as information becomes available. Hello my name is Heather Henderson my aunt was Linda Hardesty. We as the family are trying to reach out to her friends. If anyone would like to contact me my email is heathermariehenderson@yahoo.com. Thanks in advance. They said it was natural causes. My dad and her other sister are at her place now trying to get everything situated. Not sure about services yet but when I know something I will definitely let you know. I was thinking any pictures or stories anyone would like to share would be great. Thank you for getting back to me that means a lot. Bud Krueger's ash dive will be June 8, at Perris. I am sad to say that my long-time friend John Brasher suffered a fatal heart attack on Monday night (March 11) at his home in Star, Idaho. His wife, LenAnnette, has asked me to let his many skydiving friends know, and that it happened very quickly. He was discharged from the hospital last Friday with a newly-fused ankle. The surgery was successful, and he was looking forward to life without ankle pain. As many of his friends know, he lived with heart disease for many years. John was 71 and held many skydiving ratings, including D-5166 and Instructor ratings in static-line, AFF, IAD and Tandem. Over his years in Southern California, he taught at Skydive Perris, the Elsinore Parachute Center, and Hemet. He made his first jump in Hinckley, Ill. in 1972, and retired from skydiving when he and LenAnnette moved to Idaho almost five years ago. 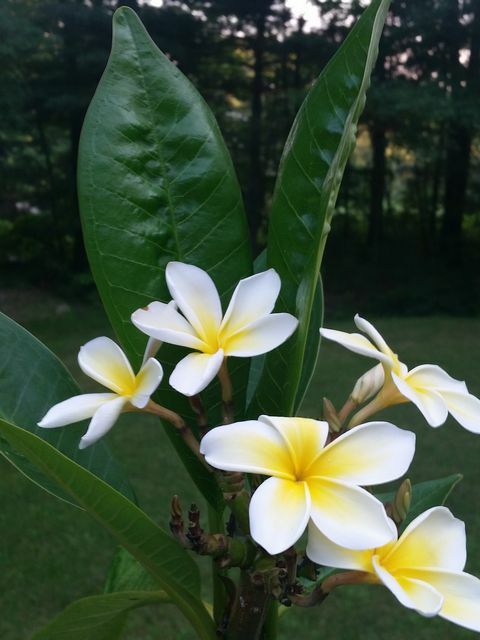 Please keep LenAnnette, John’s mother, his three surviving brothers, four sisters, and daughters Summer McDowell and Leisé Moeller in your thoughts. John was a good and steadfast friend to me; I always thought we would see each other again. An ash dive at Skydive Perris, according to John’s wishes, is being planned for later this spring. The date for John's Memorial is set for Saturday, June 22nd at Skydive Perris. More information will be posted as it becomes availabe. 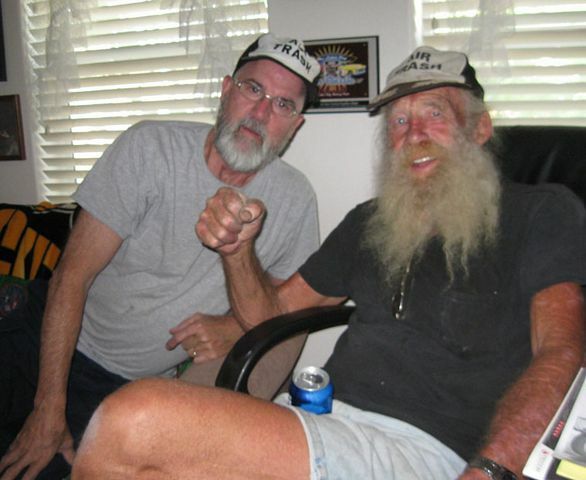 This year at the OL' FARTS boogie we'll be remembering our friend and long time Air Trash member Don Vredenburg. As of this post, we haven't heard anything from the family regarding a memorial. So this will be a good time for us all to gather and share stories and memories of our friend. Please go to the OL' FARTS page for details, and send in your name to be added to the list. Click HERE to email me your name to be put on the list. Talkd to Criss and Caz today ….”Live! 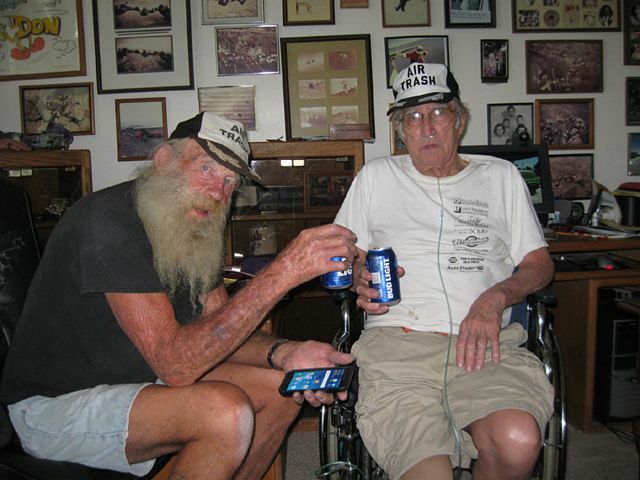 !” Both are still with us.. Caz sounds like “OK!! “ gotta get him out from the confind’s of the med system!! Same for Criss!! Went to visit CRISS MORGAN at the Hospital yesterday now,afternoon... he's at "The Lady of the Lake" Hospital in Baton Rouge... His Diabetes is kickin' up!! 'Went to visit Sunday a week ago at his place in Port Allen across the river from Baton Rouge.... Good times.. 'found out he is "AIR TRASH" from way back.... inducted into the fold by Al Frisby "before the Flood!!" but .. "Never got a hat!!" I thought,"We can't have that.. Old School AIR TRASH "Out of Uniform!!" as "Animal would say!!" ....."SO!!!".. today I brought him a "FRESH!!!!!!" 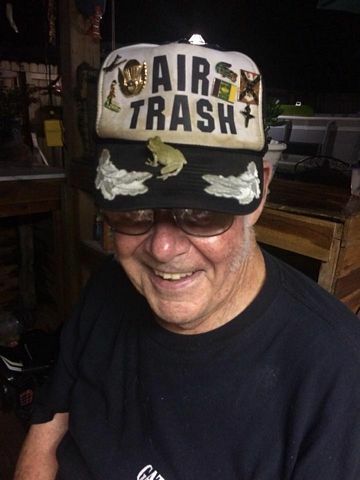 "AIR TRASH" Hat which you can see in the mug he is sportin' proudly!!! PS 'Ya got the drill on where he's at.. 'said he'll be there at least thru the weekend!! Give him a call!! (When I got to the info desk and asked where "CRISS MORGAN" is .. the lady had him dialed in, ... like "NOW!!") If ya' ever been in a hospital any length of time.. it can get "Boring!!" ... I'll visit again on Thursday!! I've been so independent my whole life, but with the sudden loss of everything I've worked for...and I've been living on disability for many years (hard to walk from a back injury)...I'm sort of on the mercy of the universe right now. I still have my land and the foundation. 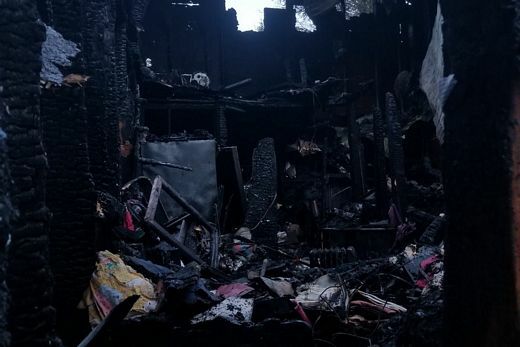 There will be people in the spring to help clear the fire mess and rebuild. But I didn't have insurance and I'm not really sure what it will take. It shouldn't take as much as my son put on the go fund me...it will take more then I have, at the moment. If you think it's appropriate to ask for help...on the air trash site or anywhere else, I humbly appreciate the consideration. I was really lucky to get out alive. I ran out barefoot...lucky my purse, phone and keys were on the way. This was just two weeks ago and I'm picking up pieces. I have a place to stay this winter. Right now I'm focusing on medical. With deepest, humble gratitude to be here. Everyone!!.. check out my post in A/T Hist!!! It’s all chronicled there!!! 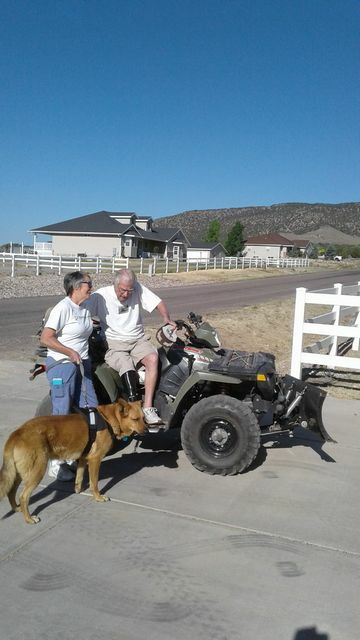 Don Vredenburg passed on Tuesday, 10-30-2018. I haven't recieved any information yet. A great visit last year. We will miss you Don. It was one year ago today that Pat Works was inducted into the International Skydiving Museum's Hall of Fame. I thought that those of you who were not present at the ceremony at Skydive Chicago might enjoy the video footage recorded and edited by Skydive TV, the Museum's media partner. At the bottom of the screen, to the right of where it says "Select Episodes" click the drop-down (red box) and select the third one down, titled "2017 International Skydiving Hall of Fame Celebration Event". Emcee and Museum President Curt Curtis introduces Pat Moorehead around the 19:30 mark, and Pat's introduction and personal recollections of (our) Pat and his contributions to the sport begin at 20:18. My acceptance on behalf of Pat begins at 23:35. If you can I would appreciate if you could post this SOS as I will be served with papers if I don't pay all my back rent and current rent-a little over 4 grand! I have started a GoFundMe.com page under the heading of ''RANDY'S KEEP ME OFF THE STREETS'' campaign. When one pulls this up they will hear my story as to how I got in this situation. I figure most people I know, know me though skydiving so this should help me. This Air-Trash brother just needs a little help 'till my V.A. benefits kick in. You might quote me as saying ''no amount to small as I could use any help!'' I really hate doing this Fred as I have never asked for public help, but I need to keep my apt. for obvious reasons. Thank-You very much for posting this. I will personally thank everyone! --BSBD Fred and keep safe. Members can also get on my Facebook page and click on my gofundme photo with a link to my campaign. 'Was visiting my friends Kevin and Terry just down the road Friday night!! We were out on the Patio/Bar / "The place to be!!" 'Was just cruzin' along into the AM's.... listening to good tunes, sippin' the Bud Light's and tastin' some cut up fresh, hot "Sour Dough Bread" I just popped out of the oven before I came over!! Terry whipped up some melted hot butter and olive oil dip with fresh herbs!!! OMG was it GOOD!! 'Was sayin' something to Kevin and felt this "THUMP!!!" on my "AIR TRASH HAT brim!!" Everyone started laughing and Terry said,"Bill, There's a 'Tree Frog' just jumped on your hat!!!" Kevin grabbed his phone and took the picture!! Sure enough it was "Carlos Gene!!!!" I took my hat off to get a look at him then he jumped off into the bushes with his compadres!!! Kevin posted it to my page on "Faceplant",,, "Bill Deli" you can find it!! I'd have ta' say this has to be an "AIR TRASH FIRST!!!!!!!" So, now in the bushes at Kevin and Terry's lives the "Mascot" of "Dixie Trash!!!!!!!" "HOORAY FOR CARLOS, HOORAY AT LAST,,,,, 'you know the drill!!'" "Laissez Les Bon Temps Rouler!!!!!! !,"
"Let the Good Times Roll,"
PS.... Yer' all probably wonderin',.... "So, who's 'Carlos Gene???" Well, remembern' our old AT Buddy the late "PAT WORKS" who needs no intro.!!! "Carlos Gene" is "Carlos Gene GODFROG!!!!" .. Anyone remember the "GODFROGS??" There' a "LOT!!!" more to the story but it's already 03:00 Monday here and I got things to do in a while and gotta hit the sack..... I will write up the story and post it to the "History of Air Trash" Page later..... It won't be long and I'll let you know when I do!! Came across a skydiving photo from 1973. Photo by Ray Cottingham. This is the first all Navy "ten man star" with most jumpers from SEAL Team One. 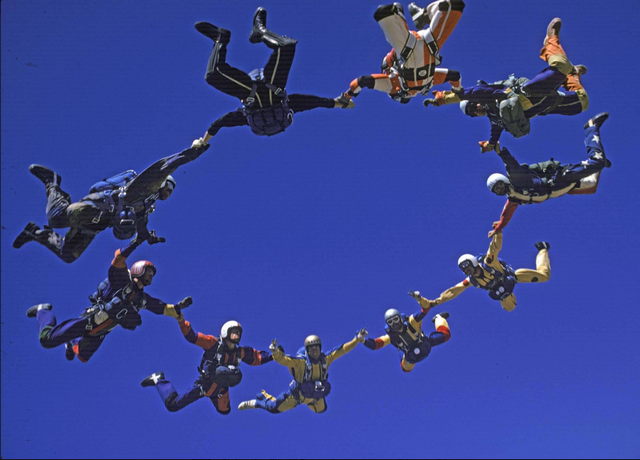 Some to go on, with me, to the US Navy Parachute Team (the Leap Frogs). I am in the red-white-blue jumpsuit on the right... yes, I'm looking at the camera. Just an old picture to relive my past... but cool. This is were I found it -- all credit to Ray Cottingham, not me. last one shows the "school, bathrooms and further down is the "Knights" area.. This one I would like to post to the "PHOTOS!!" 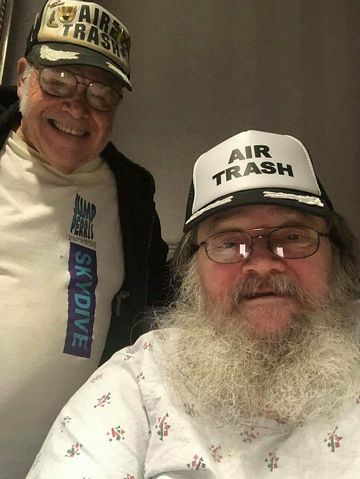 I told the story of "Harold Faulk's" Ash dive .... more later... this photo was "The Group shot" L-R Bob Lewis, then Shaun O'Neil, both who I worked with at "Sunpath Parachutes in Raeford! 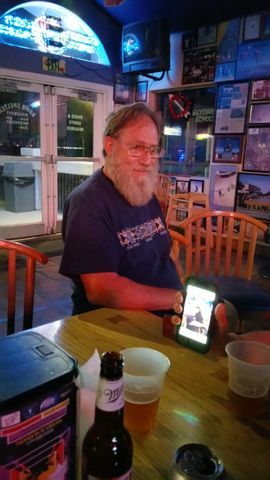 !," next is the guy with the white moustache... That's Paul "BIG HARRY" Thompson.. owner of "BIG HARRY'S TAVERN, 3030 Ft. Bragg rd., Fayetteville, NC Where we all "hung out!! ", next is "Yours Truly in the Black jump suit , "AIR TRASH" hat and holding in my arms the pouch with the "Golden Knights" crest .. holding Harold's ashes!!!!!!" the Lady on my left shoulder is "Annie!!!" Paul's Wife, Lady in the Grey jump suit is Yvette Walters.... "Great Lady Flier, does Great Camera, is wife of Keith Walters, now former XO of the "Golden Knights" and currently Head Honcho of the USSOCOM "PARACOMMANDOS" Parachute Demo Team!!!! (I'll send you a vid of one of their ops next!!) video at the end of message. BTW, I needed a "CUTE GIRL" to pull open the sack !!! I couldn't have an "UGLY GUY" do it!!!!... Harold would haunt me to my dying day if I did!! "SO!!" Yvette got the job!!!!!!!... 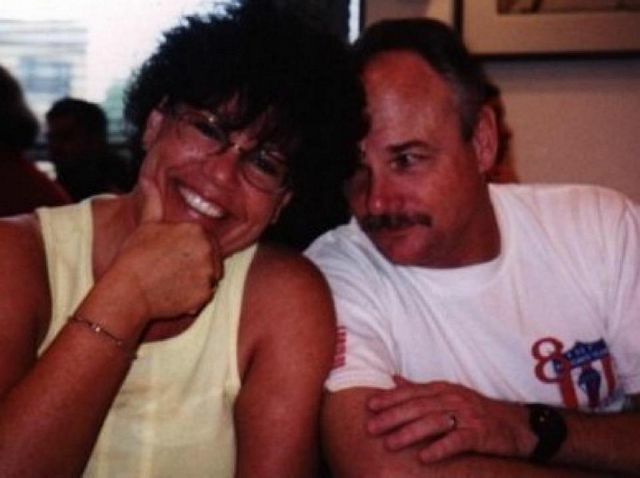 on her left shoulder is Joanie... Harold's GF and our good Friend!! behind her is Mike Lee.....then!!! 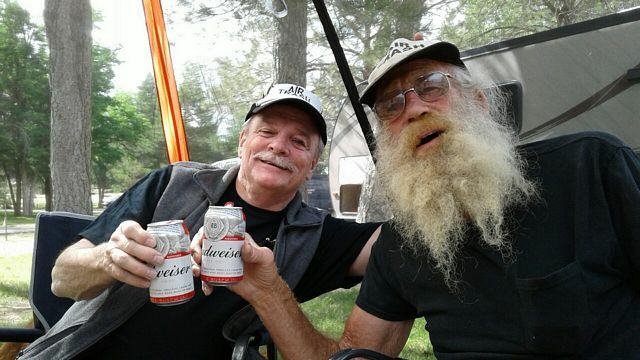 ...Standing there with the "BIG HARRY'S" Shirt and "Johnny K's (former 82nd AIRBORNE Troop who hung out with us at Paul's place) "Spit Shined Corcoran Jump BOOTS!!!!!!!... Is "DAVE PASCHAL!!!!!!!!!!!!!!!!!" Yup!! That's him... His Tandem Master (forget his name at the moment??) and Mike Lee's Brother.... This Photo was taken on 05NOV2005 as you will note this was some time ago.... this was Dave's Tandem intro jump, they followed us .."RIGHT OUT!!" and he was there to watch us pull Harold's Ash Bag!!! BTW... turned out my timing was perfect, it was 05NOV2005 when we finally got everybody organized to get to the DZ and "It was the last Saturday with NICE WARM WEATHER" before "Old Man Winter" started throwing "Noreasters" at us!! But to put all this into context, Harold was an "Old Friend" .. now and then he would show up at RAEFORD and watch us jump, .. he would say ," I wanna' do that!!" .. but the cancer got in the way..... Harold passed in September...not long after we had a "Full, Tilt, Boogie" Memorial for Harold at "Big Harry's Tavern" ... Several Bands Played, ..lots of Good friends, good times and Harold's Ashes on the "Band Stand!! "...during the event ...'just happened.. I was telling Joanie and Pau about how in SKYDIVING we took the ashes of our departed friends and released them in freefall!! A week or two later, I stopped in at Big Harry's for a Beer after work.... Paul comes up to me on one side and Joanie on the other, .. Theysay,"Bill, remember how you told us about releasing ashes of friends in freefall??" .. I said,"Yes..?" .. They said,"We think Harold would like that!!!!" .. That's!!!!!!!!!! !how I got the job!!!!!!!!! Dave Paschal was part of that event!! But he was an event of his own!! We Carry On!! 'Have to "PLAN" a trip to NC just to "JUMP THERE AGAIN!!" 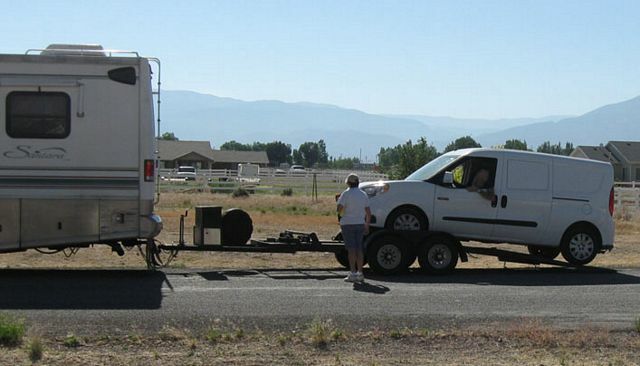 Last few trips, the weather was bad, had lots of "FAMILY" to do, you know the drill.. 'Have to do a "ME" trip!!! Hoping someone can get me the name and number of the photographer(s) who filmed the 2 jumps we made with Steve Fieldings group for Al Frisby’s 24 hour Badge, It’s been quite a few years, but I would like to get a copy of those jumps. Normally when an Air Trash guy gets profiled, it's done by local law enforcement agencies... Ha! Congratulations Bully. Yet another way to get in a cheap plug for Air Trash! 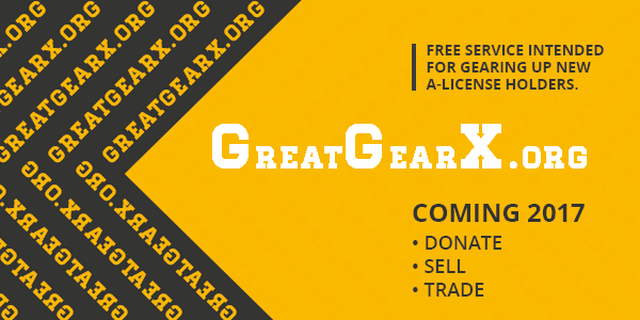 Donna launches a new website called GREATGEARX.org, with a focus on Novice and new "A" license skydivers. "I am Donna Wardean. I started jumping in 1966 at Arvin, California...(the cradle of Relative Work). In the early days, in the mid 60's, my peers were generous in sharing what they knew aboout RW. How to get from point A to point B (today this genre is formation flying of various types). Well, they were big,,, I was small. Their advice didn't always translate or work for me but it gave me a place to start. I loved the sport and challenge... and I had a great career! So as others followed me, I paid it forward. My personal passion has ALWAYS been to help people who were young in our sport to Grow, Mature and Flourish. That is something that came naturally to me because my peers, those early RW men... the Arvin Good Guys shared what they knew with me." This site isn't just for the Novice Skydiver, it's for anyone that wants to buy sell or trade skydiving related gear. This and other great links can be found on the Air Trash "LINKS" page.